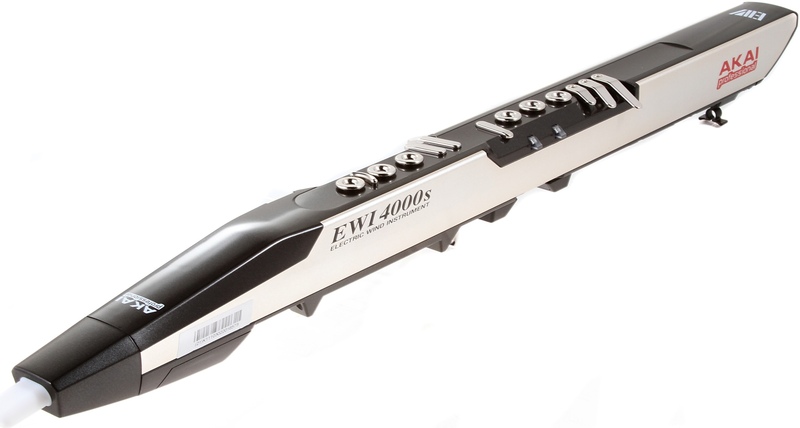 EWI4000S, Electronic Wind Instrument from Akai in the EWI series. Note: I receive no com. patchmanmusic in, but Matt is the only one to offer libraries really really well optimized for wind controllers / associated hardware. For softwares, there are plenty of other sellers (Wallander Instruments Nortonmusic patches for Reason, etc. ...). I bought this 1 month. - The bill had a chlorine aftertaste. During the first use, a random white noise in the headphones (not in the output amplifier) ​​that seems to disappear over time. Oxidation of keys from the first use probably due to the low current carried by the sensitive keys. I tried to get the antioxidant cloth I use on my sax silver, but traces reappear. - Not able to display the version. Can not use the software provided with ... error dialog, though the MIDI interface works in two directions. - Support (stand) for EWI nonexistent. Compelled to tinker with it one. - It takes a certain period of adjustment with the octave key. On the plus side ... I could copy / paste of the previous opinion. Currently, there are only the electronic wind instrument. No it is not given, but given the options, its price is justified. I would definitely do it again this election. Bought two weeks ago. The "touch n'feel" is more like a flute mouthpiece than a sax or clarinet, as it does not operate key: one puts his fingers on it, it's like the butcher holes. Also do not blow really hard (even if you can adjust the sensitivity to the opening of the mouth and thus remains Troit blow hard quickly gives the impression of blowing into a straw mouth). - The supplied strap to hold the ewi around the neck is a misra, she ESG left thumb. - No way to customize its Doig, one can simply choose from the types of prdfinis fingers. - Touch, vibrato, and bends, the VLOC and portamento are all in paramettrable sensibilitbr /> - This is my knowledge the only afternoon with wind synth controller integrated by the first " synthtiseur wind "of the market. - The software to edit the 100 internal sounds is very well designed, if only one is interested in sound design and wave-based filters is the IDAL. - You can assign midi control (CC) for some key customs and to settle what is transmitted by the breath controller, everything is very practical if you drive a sampler via midi. - The mouth is enjoyable and well rpond trs breath and vibrato (for chewing). - The last 3 keys right hand can be adjusted according to the morphology of each. - The internal synth with two voices, octaves and hold functions are possible, which is extremely interesting. Hold can be set to two fawns diffrent, more opportunities. In short, an excellent intrument. I have since 1 July. This is my first wind controller and I'm glad trs! I play the EWI 4000s in November 2006 after playing for years of ewi 1000 is a very good auussi instrument.je'm really pleased with my purchase and sounds Intgr, although I pay the new sounds in the patchman.je used with a 70 m vl for yamaha sound approximating the sound is a real instrum accoustiques.c wind I send him all my motions. it is really great the only small d may need to be c is its weight but still ... I have tried repeatedly yamaha c is not really terrible.le quality price report today is good. 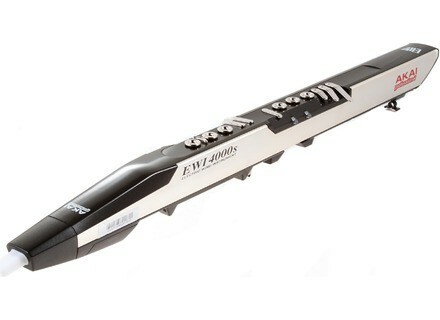 So far the best electronic wind instrument of the market . I ewi4000s for 2 months. This instrument offers many possibilities. The expressiveness when you start mastering all possible parameters controllable in real time is huge. Also the only least in my opinion the lack of sound "acoustic" but clearly it's advertised trs. If you want the sound amule must either buy a keyboard or sound module (like the Yamaha IDAL vl70m trs but expensive) or else play the VSTi (or other samplers) via MIDI by logging on PC. - Report qualitprix trs is good even if it is not given. The bte inspires confidence, the audio section is nickel (not a breath). Akai offers currently rgulirement of updating the firmware (it TRANSFR via midi) that adds new functions (accumulation of finger trumpets, assignment of the mouth or glides a control CCmidi choice ...). Hello, I possde EWI since May. I must say I'm really happy, better than j'esprais level expressiveness! The factory sounds are not all gniaux, but there's way with the editor to make other. Site (srieux and pro) is specially in the design and sale of sound banks and specifically developed to the ewi yamaha wx, with synths and diff with lots of DEMOS. In terms of expressiveness is great! We must experiment with diff. techniques because the mouth is ewi trs sensitive to the level of the attack and can sound flat and trs synth if you dig a little. Otherwise, you must know that his fingers are close to those of sax and flute beak, but do not try to reproduce the same thing forcment ... It is an instrument in itself and its own personality possde and there are plenty of tricks to find a technical point of view to make it out of good juice!